Cute Card Thursday's theme for this week is to use punches (no die cut shapes) on our cards. I used my new Stampin' Up scalloped punch and a Martha Steward punch for the leaves. I punched some small halfcircles into the chocolate chip cardstock from Su to hold the ribbon in place. Das Thema dieser Woche bei Cute Card Thursday ist Stanzer für unsere Karten zu verwenden. Ich habe meinen neuen Stampin' Up scalloped punch und einen Martha Steward Punch für die Blätter verwendet. Ich habe kleine Halbkreise in den braunen Cardstock gestanzt um das silberne Band am Platz zu halten. I coloured the cute Hänglar girl from last years christmas collection with watercolour pens and lots of Twinkling H2Os. I masked her arm to stamp the text on the tag, which is from the german Whiff of Joy christmas collection again (white christmas). There are stickles on her cap and jacket. Ich habe das süße Hänglar Mädchen von der vorjährigen Weihnachstkollektion mit Aquarellstiften und reichlich Twinkling H2Os coloriert. Dann habe ich ihren Arm "gemasked" um den Text auf das Tag zu stempeln, der wieder von dem deutschen Weihnachtsset von Whiff of Joy Stamps ist. Auf ihrer Kappe und ihrem Mantel sind stickles. I just wanted to take my chance and announce the next new release at Whiff of Joy Stamps, which will take place at January 3rd. Ich nehme gleich mal die Chance wahr die nächste Neuerscheinung von Whiff of JoyStamps anzukündigen. Und zwar gibt es am 3. Jänner wieder neue Stempel. a fabulous card Katharina, love the image and all the punched out details...great idea to punch a small half circles to hold the ribbon in place, great tip. Die Karte ist dir rundum gelungen...! Love your card Katharina, and am so excited to see the new releases next month! Beautiful card, love the image and the different elements. Can't wait for the new stamps! Wunderschön! Und ich freue mich auf die neuen Stempel!!! Your card is just amazing. Love all the details you did on this card. Great card! 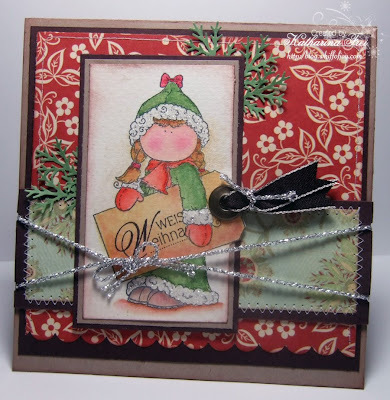 Love the image and the red paper with green branches. I shall go and see the new collection now! absolutely incredible card! All the attention to detail just makes it spectacular!! your card is so wonderful and your colouring so fantastic! I have had too go and catch up on past post, I have been out with sick animals and a bad back..
Ok...now to go and to see if I can see a sneak peak of the new releases - I need to ask Santa for some Whiff of Joy money! Love your image and fabulous papers and added detail. Gorgeous card! Why are mine never this polished! Wunderschöne Karte, gefällt mir speziell gut!!! 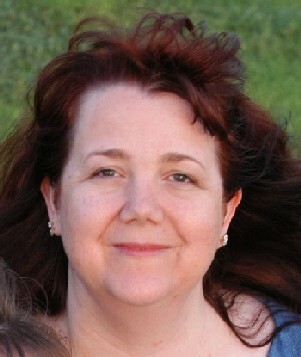 Katharina, can you tell me when Willow with hot chocolate will be in stock please? Beautiful card and stamp! I can't wait to see the new releases! 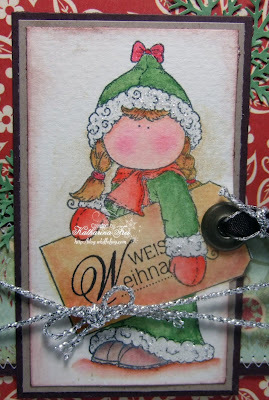 Hello Katharina - what a beautiful card and I love all the little details you have added. Looking forward to the new stamps next month. Adorable creation. Love the idea of half circles and how brilliantly you masked the arm to get the text on the tag. Good job! What an awesome card! I love how you got the cute Hanglar to hold the tag...that's so cute! I am so excited and can't wait until Jan. 3rd now!!!! What a great day you picked...that's my Grandma's birthday too...what an extra special day! Such a beautiful card, great details. And I love the way you coloured your image. Deine Karte ist sehr schön geworden Katharina. So dann freue ich mich auf den 3. Januar und kann´s kaum erwarten die neuen Motive zu sehen.